Putting away your first significant chunk of money can seem daunting, but it's not impossible. Saving gets easier the longer you do it, so here are some tips to increase your wealth. Like most lawyers, you probably started with a negative net worth. It may seem like it takes forever to pay off the debt and accumulate your first $100K of assets. I remember how that feels and put together this post to remind you that the first $100K is the hardest. A few days ago I was reading a post on Bogleheads about saving your first $100,000. I bookmarked that discussion a long time ago and refer back to it from time to time. I find it inspirational to look at the progress of people saving and building wealth. One of the best posts highlights how it took the poster nine years to save the first $100,000. For a lawyer with $250,000 in student loan debt, getting to a positive net worth of $100,000 is going to take some time, although I hope you can do it in less time. But once the ball gets rolling, the compound interest starts to make a big difference. By the time the poster had saved $450,000 it only took one additional year to jump up to $580,000. Now that’s progress! Brute Force. While most of saving is done through brute force, this is especially true at the beginning and when you’re paying off student loan debt. Brute force is the only tool in your arsenal. Want $100K? You have to save basically every one of those dollars. Investments aren’t going to carry the way. Startup Expenses. Life is expensive when you’re just starting out. New apartment? You might need some furniture. Professional wardrobe? You didn’t have that in law school. The list goes on and on. It’s not cheap to get established and some of those expenses are not optional. Salary Increases. Whether you start in Biglaw, a smaller firm or public interest, your starting salary is significantly lower than the money you’ll be making once you gain more experience. It’s no surprise that it’s easier to save money on a high income than it is on a low income. My advice is to set up a system so that any amounts in excess of $X are sent to an investment account. It’s up to you to decide what $X will be, but a system like this is effective in letting you bank your raises. Compound Interest. $100,000 will earn $10K at a 10% return. $500,000 will earn $25,000 at a 5% return. At a certain point, your investment returns make a greater contribution to savings than you can through brute force. Obviously that takes time. Inflation. Inflation devalues the dollar. The second $100,000 is worth less than the first $100,000 unless you’re in a deflationary environment. Paid Off Debt. As you’re saving now, a significant chunk of each month’s payment goes to servicing the loans. Once you’re debt free, you’ll no longer have that problem. A young lawyer with $200,000 in student loan debt could easily be paying $1,000 a month in interest alone (or less if they followed the Student Loan Refinancing Guide) and is probably paying a significant amount more. Every Dollar Counts. Too proud to sign up for a program like Ebates that gives you cash back when you shop online? That’s too bad, because those dollars add up over time. I’m looking for $1 million of them and Ebates has paid me over $500 for just doing what I was going to do anyways. I love the easy wins! Unfortunately, while the first $100K is significant because represents getting out of debt and achieving a substantial positive net worth, there’s still more saving to do. And the sad news is that it’s going to take a lot of brute savings to get to the $1M mark. Thirty precent of returns on a $300K portfolio is only going to get you closer to $400K. You’ll still need to be making substantial contributions to your nest egg. In fact, there’s a similar thread on moving the net worth needle from $1M to $2M. 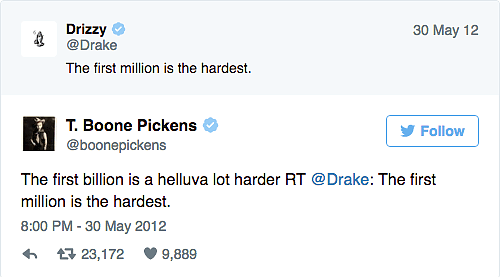 Not to be outdone, I’m reminded of this famous twitter exchange between Drake and T. Boone Pickens that actually happened in 2012. Classic. Let’s talk about it. How long did it take you to reach $100K in savings? How important is brute savings to where you are in building wealth? [email protected] tweet, I love it. As my wife and I just hit the 6 figure mark this year, I sure hope it gets easier! It definitely does. This article could easily be called the first $10,000 is the hardest! The hard part is always starting, but once you get going it’s so much easier. 3 – We just were not focused on saving much and living it up. It only took us 18 months to double that to $200K, then another 12 months to reach $300K, and recently we crossed the $400K mark, adding another $100K in only 6 months. 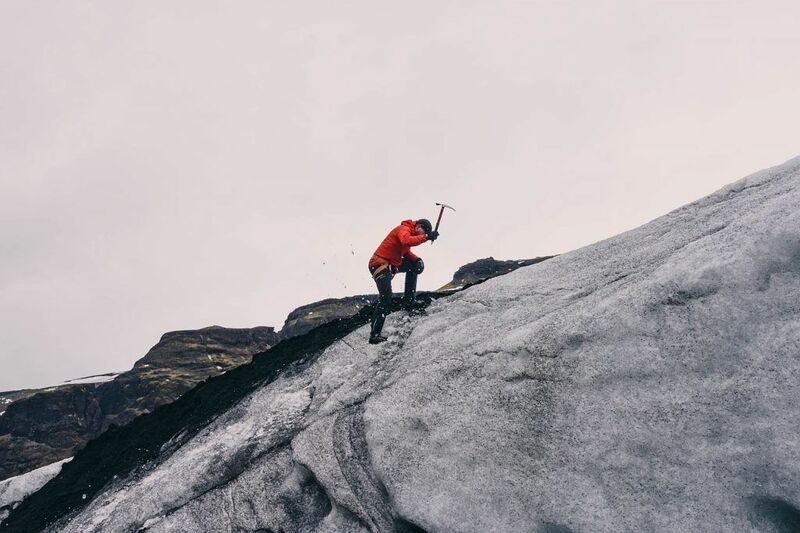 You just have to get that snowball rolling and make sure you aggressively grow your income to turbo charge the growth with robust contribution amounts. There’s going to be a lot of sad lawyers who read this since most of them have to dig out of $200K in student loan debt before they can even hit $100K. The good news is that once you reached $100K the snowball gathered momentum and look where you are now. Thanks for leaving this comment Domenic. It’ll be a great reminder why lawyers need to start saving NOW and avoid #3. I definitely agree that the first $100k is the hardest. I spent a lot of time just trying to figure out what the heck I did to myself financially in college – I ran up about $30k on credit cards for no reason. That on top of starting with an entry-level pay job didn’t make for a great start. When all is said and done, it probably took me around 7 years to get to reach $100k. As we’re getting closer to FI though, I now see very nice swings upward thanks to compounding and it does seem like every $100k comes much quicker! Really can’t wait until I get to my first $100k! Unfortunately I had to first pay back $87k on law school loans, which set me back, but looking to keep hitting the savings hard to get to where I want to be. One thing that was great about paying off my student loans though is it let me get out of biglaw! So glad to see another lawyer blogging. Congratulations on only borrowing $87K. Sounds like you got out without too much damage. Even better that you’ve paid it off. It’s funny that you say that paying off your student loans allowed you to get out of Biglaw. When I tell people they should pay off their loans rather than investing in a taxable account, people often think that somehow they’re making a lot of money by arbitraging the difference between their ~3% student loans and perhaps getting ~7% in the market. Little do they realize that they have to keep generating substantial cash flow each month to make those student loans payments, many of them sticking around in Biglaw when they’re dying to get out! It took me about 6 years after graduation to build a 6 figure net worth. I didn’t discover financial independence until the 5th year unfortunately, but once I made the necessary changes, it definitely happened quite fast after that. I had no student loans but startup expenses truly took a chunk out of my net worth. Being a lawyer carries a lot of costuming costs. It took me about two years to reach a six figure net worth through frugality. Reaching a positive six figure net worth after two years sounds like quite the accomplishment. I like how you calculated the ROI of your law degree in the Philippines. I don’t think I’ve seen any US lawyer try to do that. Fingers crossed. i just reached the 100 k mark last year. hope to get this snowball rolling this year. I can’t for the life of me figure out what that climber is doing with his axe. Non practicing attorney. Hit 100k 5 years out of law school. I had the benefit of dumping a lot of money into the market at the bottom (2009). I was young and lucky.